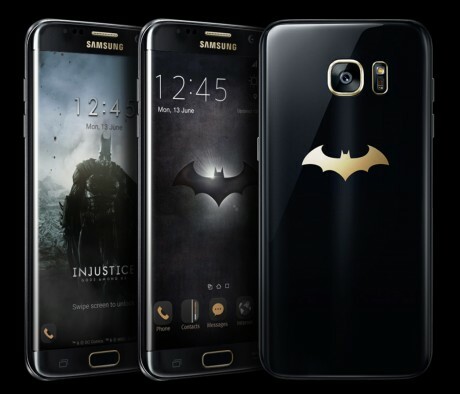 Samsung has revealed the Samsung Galaxy S7 Edge Injustice Edition, inspired by Batman and the game of the same name. Samsung says the Galaxy S7 Edge Injustice Edition package includes a customized Galaxy S7 edge with black styling, gold detailing, and the Batman logo stenciled onto the back. The package also includes a Gear VR headset, along with Injustice game credits and Oculus VR content vouchers. The underlying handset is unchanged from the standard version of the Galaxy S7 Edge. The Samsung Galaxy S7 Edge Injustice Edition will be sold in China, Singapore, Korea, Latin America, Russia, and other yet-to-be-named markets. It goes on sale in early June. Pricing was not disclosed. The FCC this week approved a pair of new Samsung phones that are almost certainly the new Galaxy S7 and Galaxy S7 edge (or equivalent). Unlike previous generations of the flagship phone, Samsung was able to have all U.S.
Samsung's 2016 flagship smartphones are updates to last year's models. Each features modern specs and brings water resistance to the table, as well as support for memory cards. Samsung's top-of-the-line smartphone for 2016 is the Galaxy S7 Edge. This curvy beauty is a powerful addition to Samsung's roster of Android smartphones. Samsung today announced the Galaxy S7 edge Olympic Games Limited Edition smartphone. The hardware is identical to the consumer version of the S7 edge, but the Olympic variant packs lots of content specific to the Rio 2016 Summer Olympic Games. Samsung today announced the Galaxy S7 and S7 Edge, upgrades to last year's designs that make under-the-hood refinements and add several new features. The GS7 and GS7 Edge maintain the glass-and-metal design of the GS6, but update the chassis to provide protection from water and other liquids.